10 pp. Roman, 443 pp. Why are Chomskyan Linguists Not Interested in Bantu Languages? The proceedings of the 3rd Congress have been edited in an exemplary way by the same Editorial House as those of the 1st and the 2nd Congress. 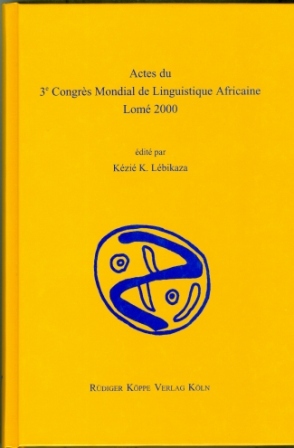 The book constitutes a thorough overview of current trends and achievements in African linguistics, and is a sort of handbook for anyone interested in African and general linguistics. of the pros and cons of such an innovation, and the outcome was that the 22nd ACAL was held in Nairobi in 1991. There was an intense business meeting at the latter conference, recapitulating many of the arguments of Montreal, but with the advantage of just having experienced the first ACAL outside North America. Out of this grew a resolution to start WOCAL, a new series of meetings which would rotate on some basis among Africa, Europe, and North America. The first WOCAL was held in Kwaluseni, Swaziland (moved from Johannesburg for security reasons) in 1994, the second in Leipzig in 1997, and the third in Lomé, Togo (moved from Marrakech, Morocco, when that organizing effort fell through) in 2000. The fourth was held at Rutgers University in 2003 and the fifth is scheduled for Addis Ababa in 2006. (Note to the reader: do not confuse ACAL and WOCAL with NACAL: North American Conferenee on Afro-Asiatic Linguistics, also held annually, started by Robert Hetzron in 1973 at the University of California, Santa Barbara). Proceedings of the first three WOCALs are available (Herbert 1997, Wolff and Gensler 2000, and the current volume). The volume at hand contains 31 articles divided loosely among phonology and morphology (6), grammar and lexicon (12), comparative linguistics (5), and sociolinguistics (8). Nineteen are in English and twelve in French. The languages covered fall into Afrasian (=Afro-Asiatic) five, Nilo-Saharan one, Niger-Kongo 23, and “other” two (the latter are Guinea French and a secret language of Brazil). No articles on Khoisan languages occur. Four of the Afrasian languages dealt with are Chadic (Hausa, Kotoko, Malgwa, and Zaar) and the other is Amharic (plus asides to other Ethio-Semitic languages). The Nilo-Saharan language is Gor, of Central Sudanic. The Niger-Kongo languages are concentrated in but not restricted to Togo and nearby countries; in alphabetical order: Bantu (3), Bemba, Bijogo, Ditammari, Gbaya, Ewe, Fula, Gbe, Gurma, Igbo, Naudm, Ngbaka, Nso, Sango, Urhobo, Yoruba, plus “various” two and general sociolinguistics three. Editorial oversight in this book is to be commended. Although many authors are not Anglophones, the English contributions have been edited to the extent so that typos and unidiomatic expressions are rare in articles I scanned.